Create in just a few clicks an animated sequence of slides from your song lyrics and Bible verses for your church meeting. Many of VideoPsalm's functions are absolutely revolutionary! 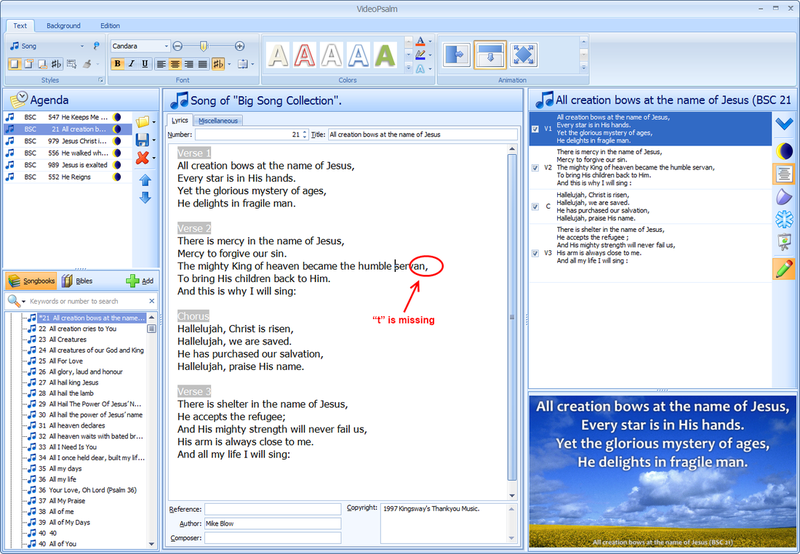 It makes it far easier than PowerPoint® to display song lyrics, chords and Bible verses. 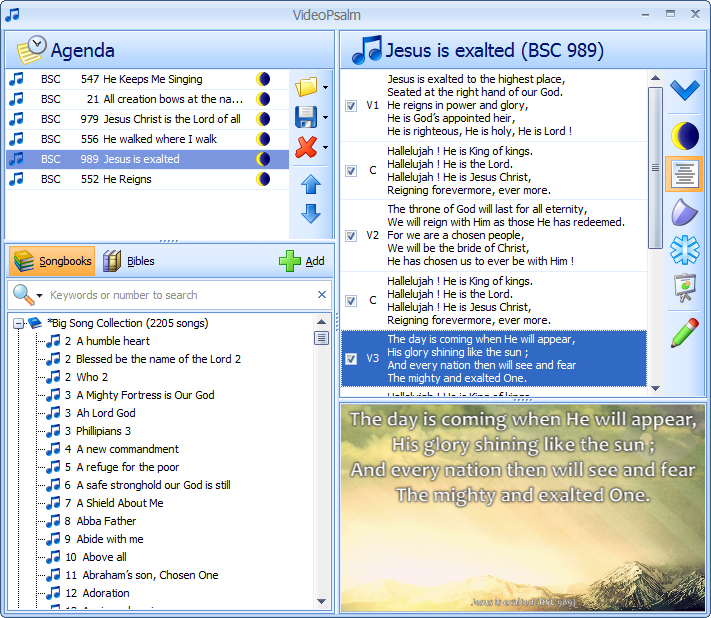 VideoPsalm was developed for evangelical churches by benevolent Christians. Find the song your are looking for. Find your songs, even unscheduled ones, during the presentation, with the help of a few keywords from the title, lyrics, author, id or any other song data. Have an instantaneous, while you are typing, full text search, in all your songs, even thousands. Powerful phrase search, that works within foreign languages, handling diacritics automatically. Don't be bothered by the punctuation or hyphens. Instant results that can be narrowed down as you add more keywords. in the translation that the pastor uses! 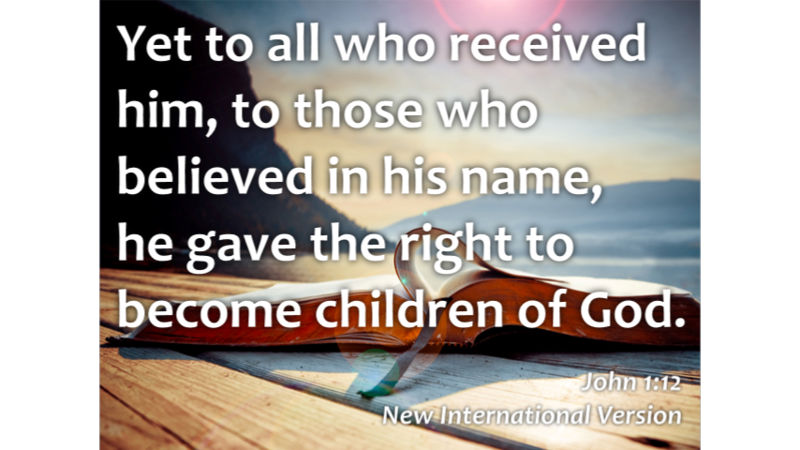 VideoPsalm contains 400+ Bible translations in 140+ languages. 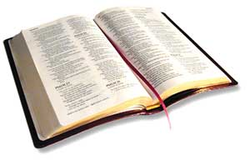 Selecting a Bible translation is easy: one single click is enough! 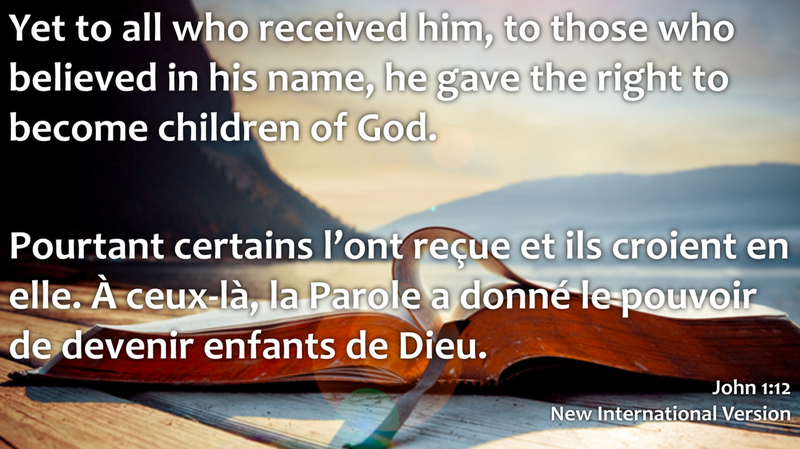 The displayed verses are automatically replaced by the new translation. 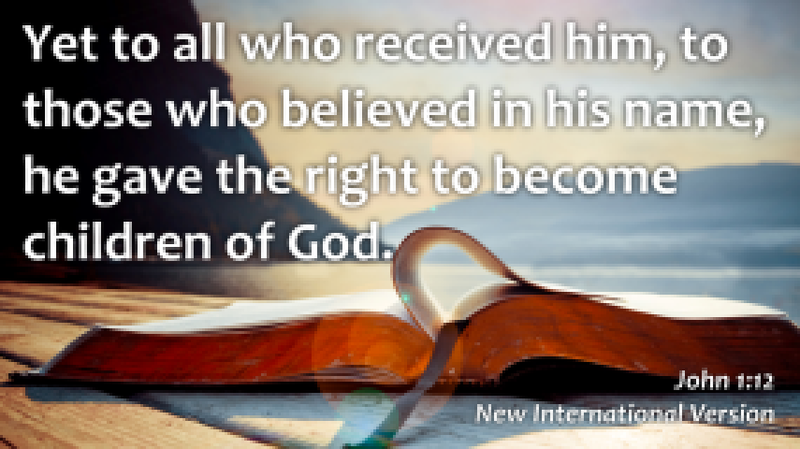 Contact us if you are looking for a specific Bible translation. Store your songs into songbooks. Create your personal songbooks in addition to the standard ones. Avoid messing up your standard songbooks with imported songs. Select the songbooks where you want to search your songs. each with its own styles, images, video loops, etc. and easily switch from one to another within VideoPsalm. Backup or restore your songbooks, Bibles, images, video loops within VideoPsalm. Edit the song lyrics whenever you feel like it! Simply type in the lyrics of your new songs and add them to your own songbooks. Correct or adapt the song lyrics, even during the video projection! Do you play the guitar or another music instrument? If it is the case, you will appreciate being able to display the chords over the lyrics, whether with the A-B-C or Do-Ré-Mi notation. Compatible with the ChordPro notation. If necessary, VideoPsalm can transpose automatically your chords with the song capo property. Do you speak English and French? In two clicks, link for example two verse selections to display them together. This way, you get two translations on the same slide! If you ever need to get a novice to replace you on the run, simply switch VideoPsalm into its simple viewing mode. Basically, your new colleague will advance the presentation by pressing the “down” arrow key at the right moment, around the end of each song verse. 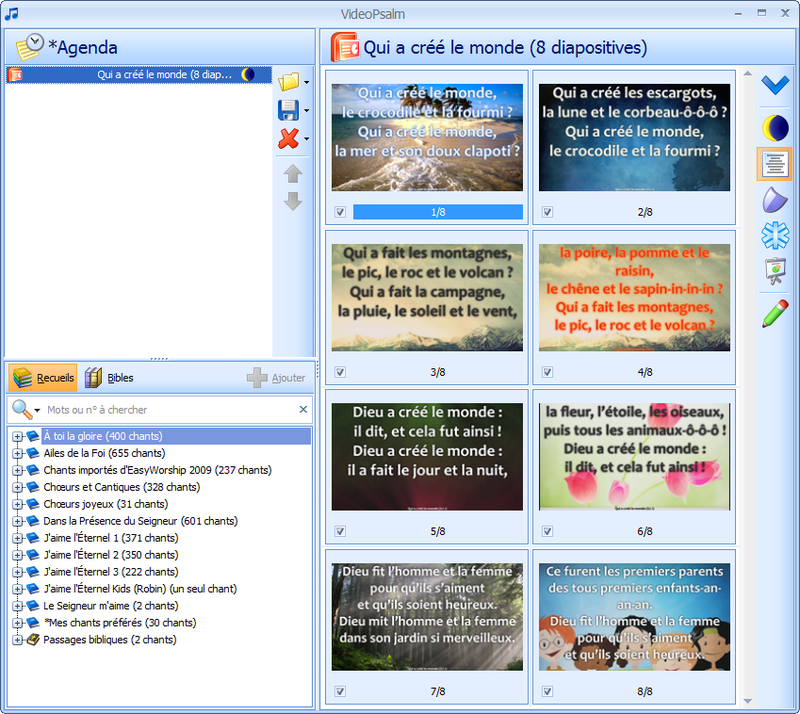 Drag and drop your PowerPoint presentations into the VideoPsalm agenda. This will embed the presentation into VideoPsalm, enabling you to control it via slide thumbnails. Advance into the presentation by pressing the “down” key, like you would do from inside PowerPoint. To display a specific slide, click its thumbnail. In one or two clicks, assign a background image or a video loop to a chorus or the complete song. Changing the background has never been so easy! Add or remove images or videos from your VideoPsalm, without having to restart the program. 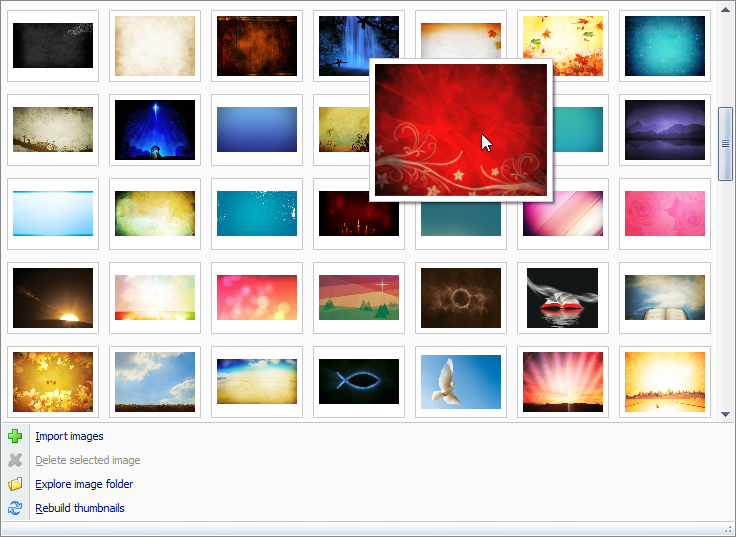 Add some creativity into the way you display your texts and images, by selecting alternate transitions from the gallery. VideoPsalm stores your slides independently from the resolution and aspect ratio of the screen. Moreover, the font size is proportional to the screen height and not to any sort of pixel unit. With one click, you can select the aspect ratio that you want to simulate. You will therefore never be embarrassed by the resolution or aspect ratio difference between your home screen and the video-projector. Never have smaller or bigger texts than expected, never have a sentence cut at the wrong place, etc. Your home screen has a 16:9 aspect ratio with a 1920 × 1080 pixels resolution. Your video-projector at church has a 4:3 aspect ratio with a 800 × 600 pixels resolution. Prepare your presentation on your 16:9 aspect ratio screen, while previewing it at a 4:3 aspect ratio, like it is at church. If there is not enough space for the whole text to be displayed in the specified area, VideoPsalm reduces automatically the text size to fit it all in. This is an extremely easy way to get standard songbooks or Bibles into your VideoPsalm. In a few clicks, download standard songbooks (thousands of songs) or many Bibles in several languages. Simply select the songbooks that you need and click "Next" twice. There are 10.000+ songs and 200+ Bibles in 80+ languages available in the VideoPsalm Online Library. You may possess songs in another format, for example from OpenSong. Via the import wizard, recycle in a few clicks all your songs or backgrounds from OpenSong and get the benefits of a fresh, fast and easy to use program. The import assistant will guide you through the steps of getting your songs into VideoPsalm. If necessary, you can contact us via the contact form. Get the information as soon as we publish it. As soon as they are available, VideoPsalm tells you via a “toast”. Assign a style attribute to a full songbook, a single song or a song verse, thanks to the hierarchical styles. Keep your mind in peace while leaving home on Sunday morning : Your playlist/agenda (on your USB key or in the cloud) contains everything needed to render the same presentation at church that you had at home. This works even if the songbook, the song, the Bible, the image, etc. don't exist on the church PC. Are you a proud owner of an Apple product? Don't be left behind, get VideoPsalm to run on your Mac! Use BootCamp, the integrated Apple dual-boot product. Parallels opens your Windows programs as if they were made for the Mac. It is not necessary to reboot your Mac to start a Windows program. Use VirtualBox, a free virtualisation solution by Oracle. VideoPsalm also offers a Mac skin under Windows. Select a skin from around 40 choices. Adjust the font in which VideoPsalm displays its interface. Extend the texts that VideoPsalm displays (menus, popups, etc.). VideoPsalm is full of fantastic and unique features. Even more features are regularly added. This happens, thanks to your remarks and suggestions, so that it evolves quickly. Tell us what you think or what you like via the contact form. It is possible to translate VideoPsalm into other languages, even from within VideoPsalm. Contact us if you need VideoPsalm in your own language. 3 clicks is all you need to install, no extra questions, you are ready to go. Complete package: no additional “modules” or “plugins” required. Subscribe to new blog articles and get instant notification on updates, new releases or new functions in detail. No personnel information asked/required, receive new articles automatically. Your browser handles everything.